The absolute number of Used Active homes on the market, which had a slight peak mid-summer of ‘09, has once again been improving. In December, there were 3,461 Active Used homes, a reduction from 4,004 in November. The New home market, which peaked in December 2006 at 2,144 Active, now sits at 317. This entry was posted in Absorption, Alabama Coast, Annual comments, Baldwin, Home values, Inventory, Monthly comments, Oil Spill, real estate, Uncategorized and tagged Alabama Coast, Baldwin County, Housing Statistics, Residential Real Estate on January 16, 2012 by Tom Brander. The absolute number of Used Active homes on the market, which had a slight peak mid-summer of ‘09, has once again been improving. In November, there were 3,663 Active Used homes, a reduction from 4,018 in October. The New home market, which peaked in November 2006 at 2,144 Active, now sits at 342. This entry was posted in Absorption, Alabama Coast, Baldwin, Monthly comments, Oil Spill and tagged Alabama Coast, Baldwin County, Housing Statistics, Monthly comments, real estate on December 11, 2011 by Tom Brander. Dollar sales this month decreased 11% to $68,050,461 from September’s $76,595744. This is 19% above October last year at $57,221,979 when sales were impacted by the oil spill and the tax credit expiration (Sect A p.2). The 12 month moving average line of sales is quite clearly on an upwards tilt as mentioned last month. On a 9 month basis, only 2004 and 2005 exceeded this years’ unit volume. While inventories are high, unit sales have recovered to normal levels. Inventories in fact have declined quite dramatically. Dollar sales still lag reflecting fewer high end sales and lower prices. This situation is also reversing, with more high end homes selling. Still, given the inventory level, it is unlikely that prices will increase for a while. On a unit basis, sales of all houses declined 9% to 335 this month vs. 370 last month, which is 17% up from last year’s 287. Used Home sales declined 15% to 335 this month vs. 370 last month, which is up 17% from last year’s 287 (Sect A p.18). New Home sales were 28 this month vs 33 last month. Low sales of New homes reflects intense competition from existing, and the shutdown of new construction. New listings for New homes increased to 59 from 45 in September. Used houses New listings increased to 559 from 549 in September with net inventory still down. The absolute number of Used Active homes on the market, which had a slight peak mid-summer of ‘09, has once again been improving. In October, there were 3,795 Active Used homes, a reduction from 4,253 in September. The New home market, which peaked in October 2006 at 2,144 Active, now sits at 343. The Absorption rate for New homes was 13 months of inventory for October vs. 14 in September. The Absorption rate for Used homes was 11 months of inventory for October vs. 13 in September. Over the last four years the drop in months of inventory for Used homes has been steady and impressive from 25 months plus in October 2008 to 11 months this October. Average sales price for all homes has been stable for the past year. For New units, prices decreased to $177,908 from $179,069 last month. (Sect A p.14). Average Used home prices decreased to $205,437 from $209,752 in September. Average Days On Market for New Sold properties in October was 291 this month vs. 188 last month. Days On Market for Used was 182 this month vs. 167 last month. This entry was posted in Absorption, Alabama Coast, Baldwin, MLS, Monthly comments, Oil Spill, Uncategorized and tagged Alabama Coast, Baldwin County, Days on market, Housing Statistics, Monthly comments on November 14, 2011 by Tom Brander. The absolute number of Used Active homes on the market, which had a slight peak mid-summer of ‘09, has once again been improving. In September, there were 3,884 Active Used homes, a reduction from 4,391 in August. The New home market, which peaked in September 2006 at 2,144 Active, now sits at 334. This entry was posted in Absorption, Alabama, Alabama Coast, Baldwin, Construction, Inventory, MLS, Oil Spill and tagged Alabama, Alabama Coast, Baldwin County, Days on market, Inventory, Monthly comments, Price, Residential Real Estate on October 11, 2011 by Tom Brander. Dollar sales this month increased 13% to $87,098,253 from July’s $77,284,985. This is 40% above August last year at $62,166,514 when sales were impacted by the oil spill and the tax credit expiration (Sect A p.2). 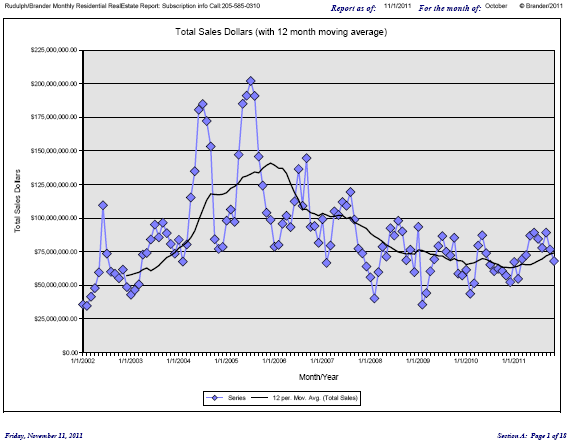 The 12 month moving average line of sales is quite clearly on an upwards tilt. The chart in Section A p.18 has been showing substantial inventory reduction for a year, but not so much from sales as people not listing properties. The reduction in Active listings will probably help the market somewhat. Inventories remain very high. Used inventory is now hovering about 4,000, a full 2,000 below August 2008, but the sales level has also shrunk dramatically. We did not see a normal inventory build-up during the summer. The number of Active listings continues to drop, which is positive (more below). The 12 month moving average line of unit sales for Used homes had a pronounced upward slope through April 2010. But with the spill, it had been showing a slight downward trend. Now, for the last year, the line is trending up. On a unit basis, sales of all houses improved 2% to 416 this month vs. 406 last month, which is 15% up from last year’s 362. In the under $100,000 price range there has been an unusual pick up in activity over the last six months going from 60-80 sales per month to 100-120 per month. It almost appears that some entity is buying up these lower priced properties? At the other end, 12 homes over $900,000 sold which is a nice increase. Used Home sales improved up 9% to 388 this month vs. 373 last month, which is up 31% from last year’s 296 (Sect A p.18). New Home sales were 28 this month vs 28 last month. The low number of sales of New homes reflects the intense competition from existing, and a virtual shutdown of new construction. New listings for New homes increased to 66 from 51 in July. Used houses New listings decreased to 675 from 697 in July with net inventory still down. The absolute number of Used Active homes on the market, which had a slight peak mid-summer of ‘09, has once again been improving. In August, there were 4,010 Active Used homes, a reduction from 4,491 in July. The New home market, which peaked in August 2006 at 2,144 Active, now sits at 347. The Absorption rate for New homes was 13 months of inventory for August vs. 13 in July. The Absorption rate for Used homes was 12 months of inventory for August vs. 14 in July. Over the last four years the drop in months of inventory for Used homes has been steady and impressive from 25 months plus in August 2008 to 12 months in August. (Sect A p.17). Average sales price for all homes has been stable for the past year. For New units, prices increased to $298,172 from $203,440 last month. (Sect A p.14). Average Used home prices increased to $202,962 from $201,658 in July. Average Days On Market for New Sold properties in August was 303 this month (I regard that as a good sign as old inventory is moving) vs. 177 last month. Days On Market for Used was 178 this month vs. 185 last month. This entry was posted in Alabama Coast, Baldwin, Home values, Monthly comments, Oil Spill, real estate and tagged Alabama, Baldwin County Alabama, Days on market, Housing Statistics, Inventory, Oil Spill on September 16, 2011 by Tom Brander. This report was published by the Alabama Center for Real Estate several weeks ago. It is interesting how spot on the projections for a slow down are being realized. 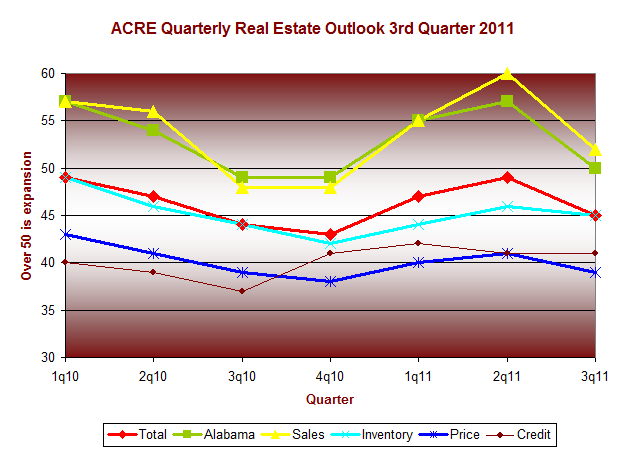 The survey projects expectations for the 3rd quarter of 2011. The scale ranges from 0-100 with 0 being much worse, 100 being much better, and 50 indicating no change expected. Spring and early summer sales have been modest and the Alabama real estate community is somewhat less optimistic as the industry transitions into the 3rd quarter. The overall index (red below) is at 45 this year vs. 44 last year at this time, indicating less than favorable expectations for the upcoming quarter. Last quarter the score was 49, approximately neutral, but showing a several quarter consecutive improvement, which has now reversed. Last year was dragged down by the oil spill on the coast and the now expired home buyer’s tax credit. The outlook for sales (yellow) this quarter is modestly positive at 52, down from 60 last quarter. The statewide overall score declined (see green line above). In short, while sales are expected to slightly improve, the inventory, price and credit indications are still below the 50 mark and expected to deteriorate. Sales will be up, but sellers are likely to be frustrated by competition and pricing, and some buyers will continue to have problems getting financing. The two most positive markets are The Alabama Coast and the North Central Birmingham- Tuscaloosa markets. North Alabama-Huntsville market has shown the sharpest reversal. The coastal areas, which had been improving (see blue line above), declined slightly. Perhaps more important than the absolute number is the fairly dramatic change in direction expressed across each of the measured questions with all measures showing deterioration after several quarters of improvement. Commercial market participants (the majority of the respondents are from theBirmingham market area) were slightly less positive in their outlook this quarter than last at 53 this quarter vs. 58 last for sales expectations. Price expectations remain weak, at 43 vs 44 last quarter indicating continued pricing pressure in all markets. The rating for credit availability remains poor, at 46 down 1 point from last quarter, a level which indicates expected contraction in credit availability. North Alabamashowed a surprising reversal in all scores. The total score of 45, down from 53, an 8 point drop from last quarter, was the largest change of the 4 regions. This indicates a concern for the national and local economy in the coming quarter. The outlook for theAlabamamarket also dropped to 50. Sales expectations inHuntsvilleare neutral at 50. Inventory is expected to increase with a score of 45. Pricing is expected to be under pressure at 42. The North Central Region along with the South Coastal region showed the least change of the state’s four geographic areas. The sales score declined 4 points to 54. Inventory, pricing, and credit are all still below the 50 mark at 47, 41 and 39 respectively. 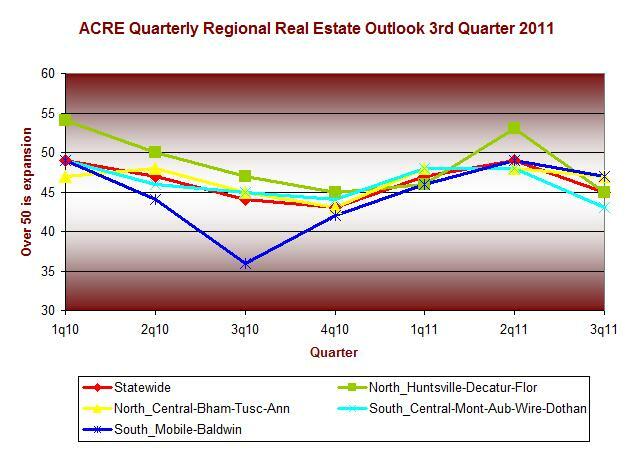 The South Central Region participants outlook for sales declined 9 points to 49. The Southern Region sales score declined 5 points to 57 and is now the state’s most optimistic sales area. Over 700 professionals responded to the 3rd quarter 2011 survey which was conducted during the month of June 2011. The survey, conducted by the Alabama Center For Real Estate now has the largest participation of any real estate survey. It provides important market insights. This entry was posted in ACRE, Alabama Coast, Alabama Real Estate Confidence Index, Birmingham, Huntsville, Montgomery, North Alabama, Oil Spill and tagged Alabama, Business and Economy, Housing Statistics, real estate, Real estate broker/agent, Sales on August 23, 2011 by Tom Brander. Dollar sales this month dropped 8% to $75,915,885 from June’s $82,835,113. This is 26% above July last year at $60,463,492 when sales were impacted by the oil spill and the tax credit expiration (Sect A p.2). The 12 month moving average line of sales is turning upwards. The chart in Section A p.18 has been showing substantial inventory reduction for a year, but not so much from sales as people not listing properties. The reduction in Active listings will probably help the market somewhat. Inventories remain very high. Used inventory is now hovering about 4,000, a full 2,000 below August 2008, but the sales level has also shrunk dramatically. The number of Active listings continues to drop, which is positive (more below). The 12 month moving average line of unit sales for Used homes had a pronounced upward slope through seven months ago. But with the spill, it had been showing a slight downward trend. Now once again, for the last several months, the line has begun to point up. On a unit basis, sales of all houses declined slightly, down 5% to 376 this month vs. 395 last month, which is 29% up from last year’s 292. In the under $100,000 price range there has been an unusual pick up in activity over the last four months going from 60-80 sales per month to 100-110 per month. It almost appears that some entity is buying up these lower priced properties? Used Home sales declined slightly, down 6% to 351 this month vs. 373 last month, which is up 31% from last year’s 267. (Sect A p.18). New Home sales were 25 this month vs 22 last month. The low number of sales of New homes reflects the intense competition from existing, and a virtual shutdown of new construction. New listings for New homes increased to 51 from 42 in June. Used houses New listings decreased to 691 from 870 in June with net inventory still down. The absolute number of Used Active homes on the market, which had a slight peak mid-summer of ‘09, has once again been improving. In July, there were 4,116 Active Used homes, a reduction from 4,524 in June. The New home market, which peaked in July 2006 at 2,144 Active, now sits at 331. The Absorption rate for New homes was 12 months of inventory for July vs. 13 in June. The Absorption rate for Used homes was 13 months of inventory for July vs. 15 in June. Over the last four years the drop in months of inventory for Used homes has been steady and impressive from 25 months plus in July 2008 to 13 months in July. (Sect A p.17). Average sales price for all homes has been stable for the past year. For New units, prices decreased to $211,221 from $243,712 last month. (Sect A p.14). Average Used home prices decreased to $201,240 from $207,704 in June. Average Days On Market for New Sold properties in July was 177 this month vs. 249 last month. Days On Market for Used was 185 this month vs. 170 last month. This entry was posted in Alabama Coast, Baldwin, Inventory, Oil Spill and tagged Alabama Coast, Baldwin County, Housing Statistics, Monthly comments, Oil Spill on August 16, 2011 by Tom Brander.